Without telling a single soul, 19-year-old Jay White packed his bags in 2012, left his family home in New Zealand, and moved all the way across the world to start a new life in the UK, with the intention of becoming a professional wrestler. In January 2013, Jay began training, and just five years later, he has a match inside the Tokyo Dome against one of the most popular and important wrestlers in Japanese history, at the biggest NJPW show of the year. 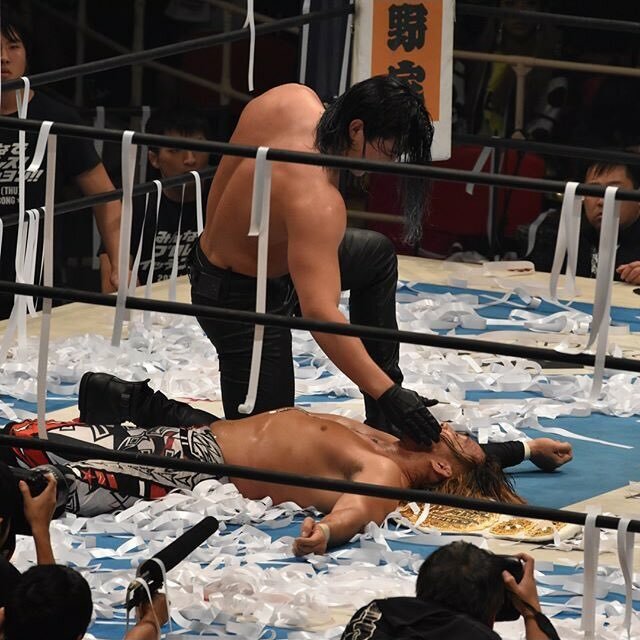 At the G1 Climax finals this year, a video package debuted showing a darkened figure in a room holding a knife, and slicing it along newspaper clippings that were plastered around the walls. The same footage played during every single NJPW show without any explanation or the slightest hint of what it could mean or who it could be. Speculation was rampant on the internet for months, but at the end of New Japan’s epic Power Struggle show on November 5th, we all found out who this mysterious knife-wielder was, when he attacked Hiroshi Tanahashi, and challenged the ace to a monumental match at Wrestle Kingdom 12. Unfortunately though, it seemed as though a lot of viewers weren’t all too familiar with this challenger. So who is the newest addition to New Japan’s heavyweight division? Well, for those that don’t know, allow me to explain. If you’ve never seen his work before, by the end of this article, you’ll know exactly why everybody should be excited to see one of the most exciting young talents in New Japan taking on a true legend. Here is The Story of Jay White: A Guide to New Japan’s Switchblade. As stated earlier, Jay White has only had five years experience in the wrestling business, and is currently 25 years old, but don’t let his lack of age and experience fool you – he is more than ready for this gigantic opportunity. Starting his career working holiday camps across Britain, White was a true natural when it came to wrestling, so much so that he was able to team with NJPW’s Prince Devitt, now known as Finn Balor, after just one year since the start of his training at a VPW show in England. The rookie impressed the future Universal Champion so much that he talked to New Japan officials about bringing him over. By the very end of 2014, backed by fellow New Zealander Bad Luck Fale, New Japan offered Jay a prestigious place in their dojo, an honour which is extremely scarce to gaijin (non-Japanese) wrestlers. Jay began his New Japan career as a ‘Young Lion’, the company’s term for their rookie talents (Learn more about the Young Lions by clicking here). As is tradition, all Young Lions shave their head clean at the start of their journey, and live at the New Japan dojo, where for the majority of their first year, they train, cook, clean, and care for their veteran trainers. They are put through cruel levels of drills and exercises, and aren’t even allowed to leave the dojo without being accompanied by one of their superiors. When they are finally allowed to wrestle on NJPW shows, they are only allowed to wear black trunks, boots and knee pads, and their movesets are restricted to the very basics of pro wrestling, usually five or so moves and a comeback routine at best. By doing so, Young Lions are forced to master the basics of being in the ring, repeating the same few moves and sequences until they are second nature. Eventually, when they are allowed to craft their own character and move-set, they will be so good at the fundamentals that everything else will be improved by it. The majority of the Young Lions’ exposure come in the form of six or eight-man tag team matches, often partnering alongside some of New Japan’s most experienced roster members, such as Jushin Thunder Liger and Tiger Mask. Over time, Young Lions are slowly allowed to introduce more offence into their arsenal, and their pool of potential opponents becomes deeper and deeper. The thinking behind this highly difficult and punishing process is to prove how dedicated each recruit is to the wonderful sport of wrestling. Only those with the strongest wills to succeed can make it through such a restrictive and soul-destroying process, which is why the system’s alumni have such an incredible track record once they graduate. Some of the company’s biggest ever stars, e.g. Kazuchika Okada and Shinsuke Nakamura, all started as lions before going on to be world champions. 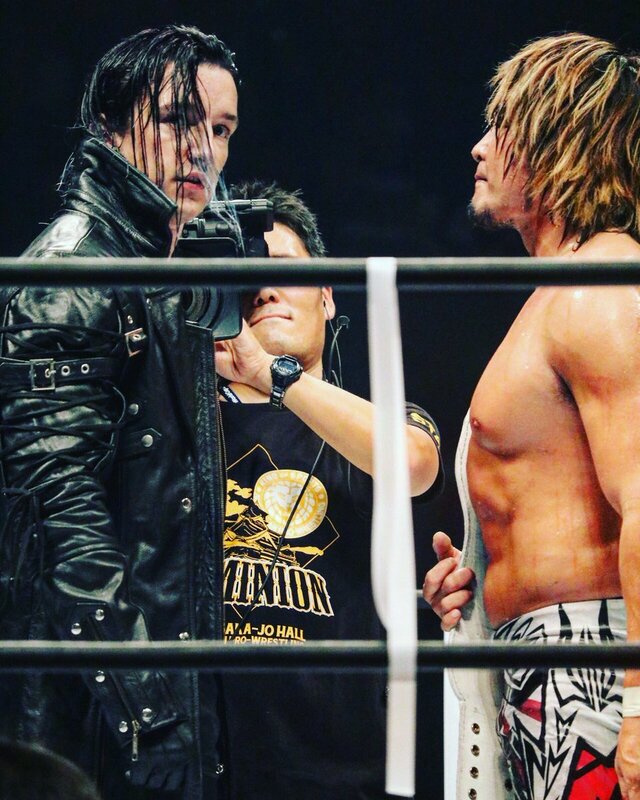 Now, usually it takes around eight months to a year before a young lion is allowed their first singles match on any New Japan show – Jay White managed it within a month. After current NXT superstar Bobby Fish had a flight delay at the end of January 2015, Alex Shelley needed an opponent, and NJPW officials were already so impressed by the relatively inexperienced White, they allowed him to step-up to be Fish’s replacement. Over the next year and a half, White mainly competed in traditional multi-man matches, often in a losing effort, but these loses weren’t just against anyone. In March 2016, he was given a monumental monumental the IWGP Intercontinental Champion at the time, Kenny Omega, just months before his historic G1 Climax tournament victory. At NJPW’s annual June show, Dominion, White made his final appearance for the company, before embarking on another Young Lion tradition – his foreign excursion. Part of New Japan’s rookie programme experience is travelling to another promotion in a foreign country, usually in Mexico, the US, or the UK, where they stay for a year or two, and discover a character and moveset to bring back to NJPW once it is fully crafted and polished. Typically, once a wrestler returns back from their excursion, they are instantly given a serious push towards championship gold, as we’ve seen with the likes of Hiromu Takahashi (who spent time in CMLL) and Kazuchika Okada (who had a terrible run with TNA). For Jay White, his excursion took him to Ring of Honor, and Revolution Pro in England, where he had plenty of success. White managed to go undefeated for nearly nine months in ROH, unusual for somebody under 200 pounds, and managed to steal the show at their War of the Worlds series of pay-per-views earlier this year when he faced Will Ospreay. During his time away from New Japan, White bulked up in weight in order to become a more believable heavyweight in preparation for his return, and developed a vicious blend of strong style, good fundamentals and high-flying offense. On November 5th, White’s excursion was over when he returned to New Japan in shocking fashion. White was revealed to be Switchblade – a dark, no-nonsense, silent character reminiscent of Crow-era Sting that utilises razor-sharp strong style to destroy his opponents. Not only did he leave Hiroshi Tanahashi, arguably the company’s most popular star of the 21st century, laid motionless in the ring on his first night back, but his arrival was also the closing moment of the final pay-per-view before Wrestle Kingdom 12, a show that was already being talked about around the world due to the unbelievable announcement of the upcoming Jericho vs. Omega match earlier in the show (CLICK HERE to read about why that match is one of the biggest in history). If you’re not already a Jay White fan, prepare to be. Due to how little mainstream exposure he has had, and the fact he has had to compete with the hype surrounding the colossal Naito vs. Okada and historic Omega vs. Jericho, not many people have been talking about the newest addition to the heavyweight division, and when they have, it’s mostly been to ask who he actually is. Well, if you have never seen this man do his thing inside the ring, you just have to look at how big of an opportunity New Japan have already given him to know that he is something special. To display so much talent at 25, and be given such a high-profile match, it’s fair to say that Jay White is in for a huge, main-event run in New Japan, especially considering how Young Lions are usually pushed once their excursions are over, and could easily be the biggest non-Japanese wrestler in the company within the next few years or so, should he choose to stay there. White’s 6’1, lean, muscular frame would allow him to be a perfect fit in either the junior or heavyweight divisions, but clearly NJPW are high enough on him to throw him right into a feud with one of the greatest heavyweight Japanese wrestlers in history. With his look, White could easily enrol as a more serious, more dangerous member of Bullet Club (which I predicted earlier in the year) or Suzuki-Gun, but he’s also strong enough to be one of the few talents in the company not associated with a faction. With other monumental matches to contend with, on potentially one of the best ever Wrestle Kingdom cards, White and Tanahashi have a huge challenge ahead of them if they want to get the world talking. Hopefully, the new Switchblade’s talents won’t get lost behind the huge names he has to share the stage with on January 4th. White is arguably the least well-known gaijin to be placed in such a high-profile match with a legendary wrestler within such a short period of time, and without question, Wrestle Kingdom 12 will be the biggest night in his career. Throwing a somewhat unknown Young Lion graduate into a main-event level match without even one bout in the company since graduating from his rookie status is a huge risk, yet thankfully, New Japan have a fantastic track record when it comes to their dojo alumni. Hopefully in 2018, we will see Switchblade Jay White cut through the competition, and switch New Japan’s heavyweight division around for the better.